This week Target is offering a high value $10 gift card when you buy 2 select diapers products. There are some high value coupons that match up with this, which makes for some pretty great deals! Thanks for this! I had forgotten about the Target mobile coupon. 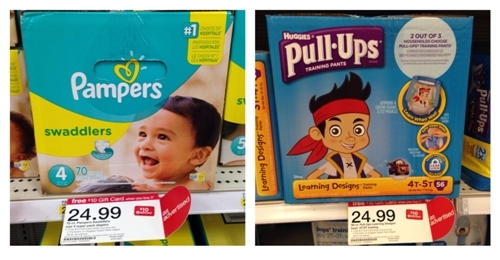 In addition to the Cartwheel offer for Pull-Ups, there’s also one for 5% off Pampers Super Packs!